DOOLEYS Lidcombe Catholic Club Ltd, incorporated in 1971, is a registered Club in NSW and as such is governed by the Registered Clubs Act, 1976 (“the Act”). The principal legislation regulating the Club also includes the Liquor Act and the Gaming Machines Act. 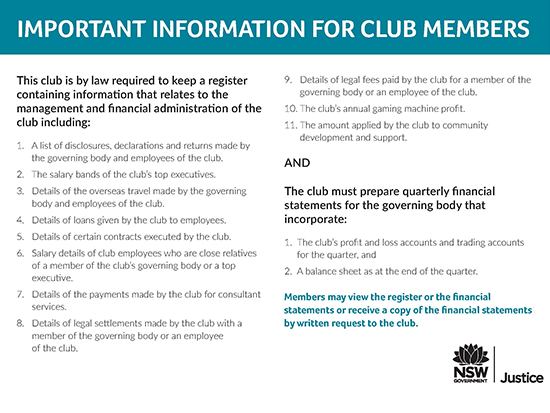 The Registered Clubs Act now provides that the only form of incorporation permitted for a new registered club is under the Corporations Act. We ask that parents/adult supervisors with children pay attention to signage throughout the Club regarding restricted areas for children under 18. Children must be kept under adult supervision at all times. Children (minors under 18) are not permitted to: be in restricted areas of the Club i.e. gaming areas, bars, TAB/Sports; Lounge and Members Lounges; approach or order from any bar; sit at tables on their own; behave in a loud or unruly manner; take food or drink into the Amusements; staff have the right to ask parents/adult supervisors to take children off the Club premises for repeated breaches of the above rules. The Amusements Room is available for use by children aged over two and up to 18 years. All children’s activities are limited to the Amusements Room. This Code of Conduct is to outline the expected boundaries and requirements of behaviour and actions of Members and Guests when accessing any DOOLEYS Lidcombe Catholic Club property or venue. In the event of any dispute or inconsistency within the Code of Conduct, the Clubs Constitution shall prevail. Any Members acting contrary to the Code of Conduct or Constitution may be asked to leave the premises, and be reprimanded, suspended or expelled from membership. 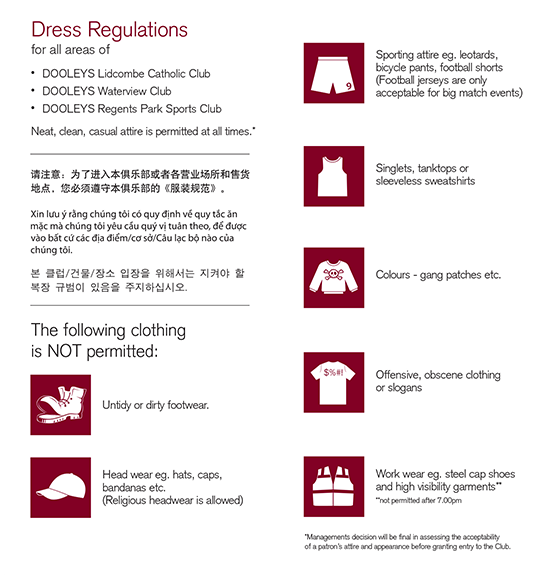 Any Guests acting contrary to the Code of Conduct or Constitution may be asked to leave the premises and refused entry and access to all DOOLEYS Lidcombe Catholic Club properties and venues. Click below to view the full DOOLEYS Code of conduct document.